It's believed that the ancient Aztecs and Mayans filled up on chia seeds before they headed into battle. So how are these tiny seeds still relevant today when we're not preparing to do battle? You've probably heard that this superfood packs a serious punch of nutrition. Brimming with fibre, protein, omega-3 fatty acids and various micronutrients, chia seeds are excellent for many aspects of your health, from your heart to your brain. But guess what? The nutrients in chia seeds feed your skin too. In fact, they fight free radicals, boost cell turnover, and reduce inflammation and dryness. If you want your skin to glow, this is the one superfood you need to be eating! Berries may get lots of praise for their high content of free radical-fighting antioxidants, but it’s time to give chia seeds their due. One serving of chia seeds boasts three times more antioxidants than one serving of blueberries. Antioxidants are essential for combating free radical damage – the main culprit behind signs of ageing like fine lines and wrinkles. SanVia Gold turns all kinds of "guilty pleasures" into stealth superfoods -Even mouth-watering brownies! Just one serving of chia seeds contains almost 20% of your daily recommended amount of calcium – an essential mineral that boosts your skin’s cell turnover and moisture levels. By weight, that’s more than milk, which makes chia seeds a great option for people who don’t consume dairy. Bonus? Calcium also means stronger bones and teeth! 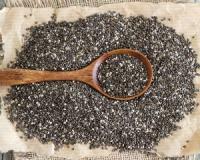 Chia seeds are chockfull of omega-3 fatty acids, which reduce skin inflammation and dryness. A single serving of chia seeds actually packs more of this healthy fat than a serving of salmon! Omega-3s also increase blood circulation, strengthen your hair and nails, and stave off heart disease. Who would’ve guessed that chia seeds could do all that for your skin? How do you incorporate these nutritional powerhouses into your diet?